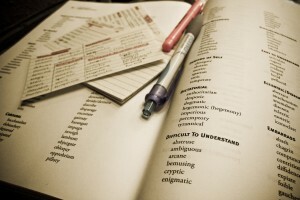 There's always a lot of talk in the language learning community about studying with SRS flashcards. I think it can get confusing at times because most programs available offer a huge array of options, functions and features – many more than you'll ever need. But I think it's important to remember what flashcards originally were. That is, a piece of card with something on the front and something written on the back. As with so many things with language learning, it's possible to over-think the flashcard thing. Are there lots of options? Yes. Does that mean we have to use them all? No. 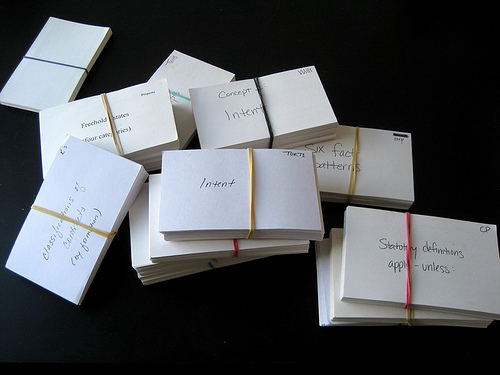 How should flashcards really be used? They're for learning the thing. Forget those fancy settings and options. Are you actually doing the thing everyday? Yes? Okay, good. Just like the conversation about “the best method for language learning” the single most important thing with flashcards is that you are actually doing something everyday, whatever your “method” is. Only once you are studying everyday should you start to worry about things like spaced repetition intervals and stats tracking. However, once you've built the habit and got the routine in place, there are a lot of interesting discussions to be had about how to use the more intricate functions of flashcard programs and Ville from Finland got in touch with a few questions. I'm a beginning polyglot and I have a couple of questions about the use of Flashcards Deluxe (or any flashcards app for that matter). 1) Do you use the spaced repetition system or Leitner? I've used both in the past, but these days I tend just to use SRS. I find Leitner a little bit rudimentary. When you get a card right it gets placed in the next deck up and will eventually make it to the top deck. The problem for me is that you won't meet those cards in the higher decks again unless you specifically select those decks to study. And how often do you train a deck that contains only language that you know very well? This isn't a criticism of Leittner at all, more a reflection of how I like to study. My main aim with technology is always to make my life as easy as possible, and SRS helps me do that because I don't have to make any decisions about when I see a particular piece of language again. 2) Do you stuff all your words under just one huge deck? Most of the time, I do actually just stuff everything under one (increasingly huge) deck! Again, if you're more organised or patient than me, it may well be good practice to have multiple decks organised in whatever way you like. But for me, that brings me back to the same issue, namely: if you have multiple decks you then have to make multiple decisions about what to study. Studying with flashcards makes up only one element of my language study, and so I want it to be as easy and pain-free as possible when I actually come to do it. Sitting down to study and having to choose which deck to work on is not what I want to do. I want to simply open up my, go directly to my Cantonese deck, and crack on. More often than not, I just fire up the app for 30 seconds whilst I'm waiting for something. I don't want to be choosing decks because I know that I'll end up neglecting some of them. It's worth mentioning that I'm fairly selective these days about what language I put into my Cantonese deck. What I don't do is just stick every new word in there. I only input language which I think is important for me to learn at this stage or else other random language that is very interesting to me. As a result, my Cantonese deck is not what I would call unwieldy. It's made up of only quality language, and so I don't have a problem with stuffing it all in one deck. I do occasionally create a separate deck if there is some language that I specifically want to learn in a hurry or concentrate on. For example I do have one separate deck of Cantonese adjectives and another of food (quite a big deal in Chinese!). I did that because I wanted to get those particular words learnt quickly at one stage and that is something which is difficult to do if you have one big deck. So as you can see, ultimately it comes down to making the right decisions based on how you learn best. …but it's certainly strenuous. Have you made use of the drawing function or do you think it's enough to see/pronounce the word and move on? I guess you're talking about the input option, where you have to actually type in the answer to each card. Personally the only time I would ever consider doing this is to learn Chinese characters (or another difficult script). Inputting things is very strenuous and slows you down massively. I've been influenced in this regard a lot by what Steve Kaufmann talks about in acquiring language. That is your brain will inevitably forget things. However intently you try to learn something, your brain will forget some of it. As a result it's a much better strategy to to aim for high-volume, accept that you will forget some of it, and just keep going. Play the numbers game. So in the case of Chinese characters, as Steve says, you would practise 30 a day with the hope of remembering 10. If you relate this approach to general language learning, you would read as much as possible and aim to take in language naturally through that method, on the understanding that you would read 100 words and maybe remember five. I think this is the most natural way to do things because you are always maximising your exposure. Actually typing or writing in the answer to a specific flashcard might work for you if, for example, you are aiming to learn a small number of words or vocabulary items very thoroughly. I don't dismiss this method (in fact a friend of mine was developing an app especially for this purpose), just that it's not for me. Too much like hard work, and for me it has to be, above all, fun! Like this post? Please Like it on Facebook using the buttons around you. Got a question? Ask me anything on my Facebook page. How to learn vocabulary with some cunning technology!